Here’s the scoop: Richard M. Hollingshead, Jr. loved three things: movies, cars, and his mother. It seems that Momma Hollingshead was a rather robust woman, and found it too uncomfortable to sit and watch a movie in the chairs at the theater. In 1932, Richard began working on the problem. He nailed a bed sheet up between two trees for a makeshift movie screen, pulled his car into the driveway and set a 1928 Kodak projector on the hood. Using blocks and ramps, he tested spacing and height variations to figure out how people sitting in cars could best view the movie. Hollingshead envisioned his “drive-in” movie theater as more than just a place to watch a flick. He saw it as a meeting place where people could bring their families for a fun evening out. He received a patent on his invention in August of 1932, and opened the first drive-in the following June, in Pennsauken, New Jersey. It only operated for about three years, but the idea set in motion an interest in the concept that experienced a steady growth through the 30’s and 40’s. FUN FACT: The first drive-in movie shown was the comedy Wives Beware. In 1948 there were over 850 drive-in theaters sprinkled around the US and Canada. 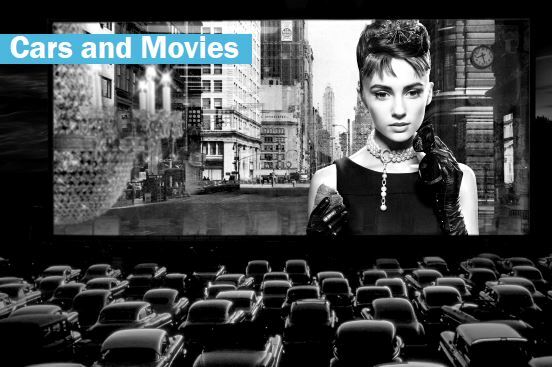 The end of World War II and the introduction of the Baby Boomer generation sparked a movement in the industry, and by 1958 there were close to 5,000 theaters in the US and several other countries. During those same 10 years (1948-58) 5,000 indoor theatersclosed due to the popularity of the drive-in. Times were tough back then; some theaters had “buck night” where patrons could get in for one dollar per car, but thrifty teen-agers saved their dough by stuffing people into the trunks of their rides. People didn’t just go to the drivein to watch movies. Like Richard Hollingsworth imagined, they came in droves to be entertained in many ways. Playgrounds for kids and concession stands were only the beginning. Because movies couldn’t be shown until after dark, savvy theater owners added other attractions (for a small fee) to encourage people to arrive early. People would come 3 hours before the film started to grab a bite to eat, ride miniature trains, take a pony ride, or play miniature golf. And it goes without mention, that after dark, lovers found their own forms of entertainment. FUN FACT: Some scenes in the TV series Happy Days were filmed at the Franklin 100 Theater in Franklin, WI. It closed in the late 70’s and the screen collapsed in the spring of 1999. The decade of decline: new theaters were popping up here and there, but just as many were closing. Families weren’t coming as often, so the playgrounds and extra attractions were axed. Audiences now were mostly teenagers and adults, and that brought a change in the types of movies that were shown; beach movies of the sixties and slasher flicks of the seventies were all the rage. FUN FACT: Top 5 things found at a drive-in: Steamy windows, hickeys, talking food commercials, horn-honks instead of clapping, empty poles where speakers used to hang. The availability of VCR’s, cable TV, DVD’s and high-tech home entertainment systems pulled the curtain on the majority of drive-in theaters. The digital age essentially nailed the coffin shut on the industry. To switch from film to digital projection at a drive-in, owners were out about $70,000 per screen. Ouch. As of 2013, less than 400 drive in theaters remain in North America. You can get an in-car digital movie player for your ride, but it’s just not the same.